I have used Quicken for Mac 2007 for years. When Quicken FINALLY published Quicken for Mac 2015 I purchased and imported my data files. Everything seemed to import successfully. However, the only reason I use Quicken is to download, reconcile and category track my bank accounts and credit card accounts. After checking settings in each of the these accounts and verifying the accuracy of account and routing numbers I attempted to update these accounts online. I received various errors (including 1002) but could not successfully complete the downloads. The "help" screens provided no solutions. The program acts like I need to setup the accounts anew. It always asks for passwords, but does not recognize them and continues to ask repeatedly. I have downloaded the program twice and attempted an initial setup ten times. I am on the verge of insanity now that I have not been able to use the program for over 2 months. This is the worst implementation of software that I have seen in the last 10 years. If you have not tried the following please attempt this first..
Close Quicken Essentials or Quicken 2015 for Mac. Open the Finder, and choose Go > Home. Browse to Library > Preferences. Move all Quicken Essentials or Quicken 2015 for Mac preferences to the trash. From the Finder menu, choose Go > Utilities > Keychain Access. Select Login under keychains, and Passwords under Category. Delete the Quicken ID Manager (If multiple listed, then delete each one listed). Empty the Trash, and then open Quicken again, and then open your existing data file. Select an account and click on the Status button at the bottom of the register. Click on Update for any one of your accounts, and enter the password ***** your Intuit login when prompted, then click Continue. Continue to update all of your accounts until they have all been updated. 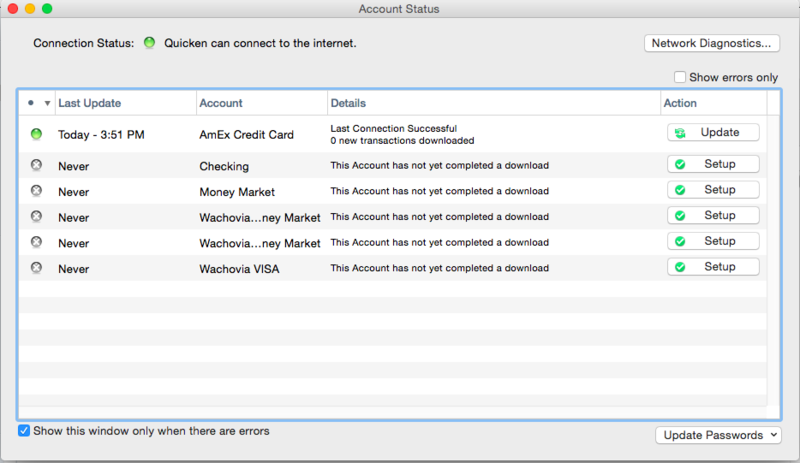 Restart quicken and it should let you update the accounts, after you enter your quicken online services, ID and password. If you could, read over the steps above and try to complete them. Or, if you would prefer I can connect to your mac from here, during a screen sharing service.. And carry out the repair for you. Let me try it, since #3 can't be done in Mavericks. You can still get to library/ preferences in mavericks.. Was that the #3 you are referring to? If so.. You can reveal the user library as follows. choose Home from the Finder’s Go menu (Go > Home); or press Shift-Command-H. Still in the Finder, choose View > Show View Options (or press Command-J). Near the bottom of the resulting View-Options palette is a setting called Show Library Folder. Enable this option. Your Library folder is immediately visible. If youve run into any issues, or cant find the library/preferences folder. Let me know where your getting stuck. There are no "con.intuit" files on my computer. There is no "status" button at the bottom of the Quicken screen. Inside your user/ username / library / preference folder. Before we move onto any other steps.. We must find and delete the com.inuit files. I searched for any "com.intuit. . . " files anywhere on the machine and there were none. You cant just do a search, you must manually navigate to the user / username / library / preferences folder. Then, when your inside the preferences folder, you have to scroll down, and manually locate the files. I went to the "user / username / library / preferences" file and there were NO intuit files in the folder. There is no "preferences" file. Only a "preferencepanes" file with no "intuit" files in it. These two files are on your computer. If they werent, quicken wouldnt load. It couldnt run.. I know it can be difficult to find the right library folder at times.. But.. They are there.. I used Spotlight across the entire machine to search for both files separately and there were no such files. You cannot use spotlight, or the finder to search for the files by name. You have to manually locate the files.. It may be simpler, if you and I connect during a screen sharing session.. So that I can go through your library / preferences folder. Locate the files, and carry out the other repair steps.. And ensure that this issue gets resolved.. I'd prefer not to give you access to my machine. Ok.. Let me ask you a few questions then. When you go to your mac HD.. and open it.. And you see the system , and user libraries. When you click user.. How many usernames does it then show ? I am using OS X 10.10 (Mavericks). I dont want you to go inside system. Under the folder "users" on the HD, I have "BTFlorence" (me), "Guest", and "Shared". The is no "library" folder under BTFlorence. Only Desktop, Documents, Downloads, Movies, Music, Pictures, Public, Sites. Ok, stay where you are now.. Inside the Bt Florence folder. into the terminal, and then hit enter.. It may ask for your mac login password. did you copy and paste this command? we should now see a library folder, inside the bt torrence folder. if its closed.. Lets do this next..
Quicken now open. Other two files on desktop. Gotcha.. Did you delete the quicken id manager, all copies.. from your keychain , login, passwords? and did you empty the trash? Ok.. With quicken open, try to update your accounts.. It should ask you for your intuit login and password..
will it let you enter the password ***** update the accounts now? It asks me for my Wells Fargo Bank password. excellent.. does it let you enter it and accept it? Ok.. But its not continuously asking for the password *****? Lets try this step again, for the wells fargo account. After you click update and enter the password.. does it try to update this way ? Can you double check and see, if you are running the newest update to quicken 2015.. heres how. Ok.. It says its updated today at 317 pm.. But it didnt download any new transactions for the wells fargo account? Maybe, close and open quicken.. And lets have another look.. It made the connection to the update server.. Accepted the password.. Maybe a restart will help it populate data into the account folder. Do you have more then one account.. or just the wells fargo? I also have Amex and it has been updating even before this. There were Wells Fargo entries in the keychain for quicken. Should we delete them? Yes, we should delete the quicken wells fargo entries..
Also.. did you run the check for updates, for quicken itself? Select the Quicken menu then Check for Updates ??? Already got updates before we began. Got an error 1002 when after putting in Wells Fargo password. To be clear.. You went to the keychain, login passwords, deleted the quicken entries..
Then, did you close quicken, re open it, and then enter wells fargo again? Since we didnt get the error before.. May be a good idea just to take 2 minutes, close quicken, delete both com files. then go into the keychain, and delete every quicken and wells fargo in there too. Gotcha. Lets get rid of all wells fargo inside quicken, and all the quicken , intuit, and any intuit ids.. Right.. But now that we took out the passwords. We need to click the account, and click update ..
Ok.. And its still not showing any transactions entered or downloaded after 822 ? Got this error screen for the 100th time when I tried to update the Weels Fargo account. Its not showing your wells fargo account there.. At all.. I did not have mobile connected. Can you try going to wells fargo, launching quicken web connect.. from the wells fargo website. letting it download the qfx file. And then, clicking on file, import within quicken to manually import your wells fargo data. It won't without me going totally online for statements etc. Since I have nothing that currently works other than the paper, I will not go completely to online. I think we've beaten this to death and I'm no further along than I was when we began hours ago. My intention is to throw the package away. and find an alternative. Nothing should be this difficult, especially after it has worked perfectly for the past 7 years. You could always continue using quicken 2007. Since it was working.. The difficulty, lies in getting everything set up. Thanks for your patience, but unsuccessful assistance. If your not familiar with the new program, it does take time to get it working.. This is why I offered to connect and fix the issues for you.. This is something I do day in and day out.. In an hours time, I almost certainly would have resolved the issue, and helped you make a backup..
As far as Q 2007.. It does work on the newer macs.. If you dont want to continue now, I will be working Monday, and then again on Tuesday , off wednesday, and back working thursday friday and saturday. You would be hard pressed, to find someone else on a Sunday, or any day. Who would put the time, care and effort I have into assisting you. To turn around and rate me with poor service, shows that you havent had much experience with tech support to know what good service is. I did my best to assist you, even patiently explained to you how to get to the user library folder. But basically from within the quicken you have to remove it from the update and then put it back in. It is not setting up the entire account again. Just setting up the online access part. 1. Speaking to a human, since Intuit support has no such person. 2. Find someone that had an inside knowledge of Quicken for Mac 2015 beyond what I had found on the Intuit Discussion Groups. Someone that had worked with the problem before, or had inside knowledge from Intuit. 3. I had found your suggestions on the Discussion Group Q&A by investing 5 minutes before I contacted you, and I had tried the solution twice before we started down the path. I was thinking that at some point you would add something that was not on the Q&A. 4. After 2.5 hours your recommendation was don't direct connect with Wells Fargo but download the data from Wells Fargo, or go back to Quicken 2007. This certainly appeared to be a waste of my and your time. If you need a higher rating, here it is. I have been using quicken for 10+ years on a windows pc computer. Just purchased Quicken starter edition and installed on computer.